Ultrasound is a word that is often heard these days in conversations, on the television, and elsewhere but what is it? “Ultrasound is cyclic soundpressure or wave energy with a frequency greater or higher than the upper limit of normal humanhearing”. This limit varies from person to person, depending on genetic ancestry, physical fitness of the inner ear and age. It is approximately 20 kilohertz (20,000 hertz) in healthy, young adults and thus, 20 kHz serves as a useful lower limit to begin describing ultrasound. The production of ultrasound is used in many different fields, typically to penetrate a medium and measure the reflection signature or supply focused energy. The reflection signature can reveal details about the inner structure of the medium, a property also used by animals such as bats for hunting. Perhaps the most encountered examples are the security car and building alarm systems sounding on into the night. The most well-known application of ultrasound is its use in sonography to produce pictures of fetuses in the human womb. There are a vast number of other applications as well. My colleague William, also a BMSE Surveyor, has produced a very interesting article on how we use Ultrasound to determine the thickness of metal Yacht Hulls for example and this is also available to read on our site. Surveyors may also use Ultrasonic Leak Testing (ULT) to determine the water or air tightness of any seal in opening ports or hatches and this is the subject of this short article. To begin with let us look at the equipment I use for my ULT surveys. 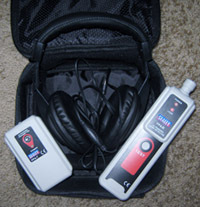 Other surveyors may use differing models but the basic concept remains the same.We have an ultrasonic sound generator and transmitter,in this example the ultrasound is in the range 38 kHz – 42 kHz; a means to detect or receive that sound and then finally a means to convert that sound into something that I can see or hear. Remember the definition of Ultrasound, “Above the range of Normal human hearing”. Without the last part it would not be much use to me or anyone else. On the left of the picture is the transmitter and generator. On the right is the receiver and converter which contains an LED indicator; the headphones are very sensitive and enable me hear the equipment output. So how does it all work? Ultrasound is a “Wave” of energy and like all other waves it needs a medium to travel in. Water or air is ideal in this case. Provide enough waves of energy that are just at the correct intensity so that they do not penetrate solid materials, toughened glass or GRP for example, encompass that inside a sealed container such as the saloon of the yacht, and check to see if any energy or ultrasound escapes. The transmitter is simply placed inside the vessel and all hatches, washboards and ports are closed tight. The receiver can then be used externally to pinpoint any leaks using the LED display or sound. If the hatch or port seal is water tight then no ultrasound can escape. With this model when the receiver detects any at all it emits a clear pulsing sound which gets louder and faster the greater the amount it detects, in addition the LED illuminates. So with this simple test, which may take only about an hour on an average yacht, we can detect the smallest of leaks with amazing accuracy in all the ports and hatches. It can even be used to establish if a leak exists in a joint such as the Hull and Deck for example, however, this would take a little longer to complete. It is not 100% proof but is very reliable and very useful as a standalone survey or an extra in a Pre-Purchase survey. As a diagnostic tool it is also very useful at tracking down the source of a leak detected using our moisture meters. 6, Foxs close, Holwell, Sherborne, Dorset. DT9 5LH.